In the early years of film, movie making was very much a “physical” process. There was no way to create a landscape for an audience through computer trickery, you had to create it in at least two, and often three, dimensions, in order to convince the audience that it existed. While early film was often satisfied to simply work on indoor sets and small stages, by 1914 film producers and directors were starting to make elaborate environments for their actors to perform in, and sets were getting bigger and bigger. 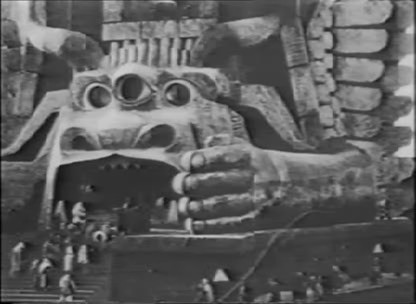 Although the other contenders had some good work, noted above, there really was nothing to compete with the grand scale and imagination of “Cabiria.” D.W. Griffith himself was floored when he saw it, and would try building on that scale two years later when he made “Intolerance.” But until then, nothing could hope to touch it.